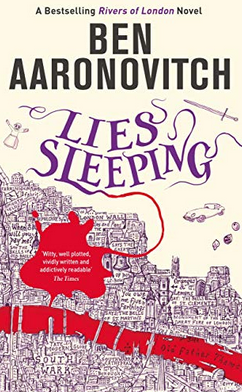 What better start to the reading year than the latest installment of Ben Aaronovitch's Rivers of London series, Lies Sleeping? I gorged on this novel like a box of Christmas chocolates. 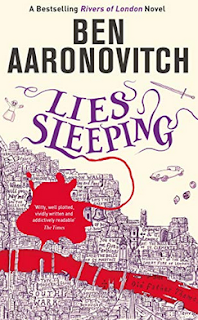 There are so many things to love about this series -- the thrilling combination of modern police procedural and ancient magic; the humour and smarts of apprentice wizard and Detective Constable Peter Grant; the diverse cast, an accurate reflection of a modern city; and the ageless history of that same history which continually intrudes upon the present, through Peter's architectural asides or the river gods and goddesses. Okay, so I sometimes get confused about the plot and the burgeoning multitude of characters (probably because I haven't kept up with the comics and short stories set in the same universe), but it doesn't spoil my delight. I owe a huge debt to Memoranda for putting me onto these books; see Michelle's review here.